I may as well go straight to the punch line. My training went an awful lot better than I expected. And the best part of it all: my knee felt great throughout. I noticed the odd twinge at the start of my first big climbing day, but that was probably a case of being oversensitive in advance of what I knew would be a reasonably challenging ride. I felt no soreness in between rides (other than the good sort that presents in the muscles to tell you that you’ve done ‘a good job of work’). The block of training seems to have worked. When I returned to the UK and did a 40 km route that I’ve done a couple of times before (both sessions resulting in more-than-usual knee discomfort), I knocked 8 minutes off my previous best time, completing it in under an hour and a half. And without a twinge or a hobble to show for it. Good times (in all respects)! Whisper it, Majorca is almost as good for cycling as the Peak District. For someone looking to get in a good stint of training (whilst wearing minimal clothing), the largest of the Balearic Islands is perfect. 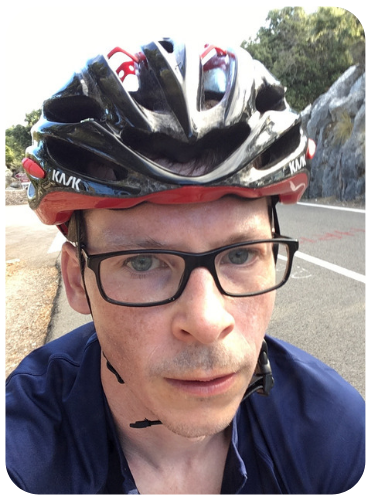 I’ll be doing more posts on cycling in Majorca in the future, so I’ll try to keep this cycling lettre d’amour brief. 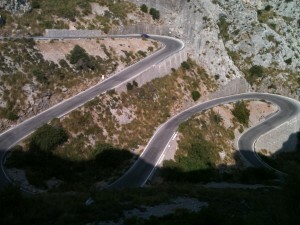 Majorca has beautifully smooth roads, even going up and down the mountains. The roads tend to be quiet (though you’ll want to time your rides to avoid hitting the hairpins at the same time as the tourist coaches). The weather is splendiferous (though in the summer, rides at the start or end of the day work best). The climbs (or at least the ones I did) tended to have reasonably constant gradients. They are not so extreme that you find yourself running out of gears (provided you’re riding a triple or compact chainset). It’s easy to get into a steady rhythm. The climbs are longer, and go higher, than the majority of the climbs in the UK. It’s quite easy to find climbs that are 7–10km+ in length, with vertical heights climbed of 700m and beyond. If you want to do that in the UK, pretty much the only comparable climb would be Bealach-na-ba in the Scottish highlands (which most people would find considerably more difficult to get to that Majorca). Once you’ve gone up, you get to come down. Quickly. The same lack of rolling resistance that sped (!) you up the climb, helps you to fly down at whatever speed you feel comfortable. The absence of potholes mean that wheel-busting surprises tend not to lurk around every corner (other than the occasional suicidal goat). Even the steepest roads were two lanes wide, with lane markings down the middle. Provided you stay on your side of the road, the risk of finding yourself parking your bike on the roof of a car (Peter Sagan style) is low. I’m not sure I need to say this again, but compared to the sharp, steep and bomb-cratered climbs we’re used to here in the UK, climbing in Majorca is a pleasure. The Majorca trip contained my first ‘proper’ classified climb. The highlight of the trip (and the focus of my training in the early part of the week) was our ascent of the climb from Sa Calobra (at sea level) to the Coll dels Reis (the climb is known amongst cyclists as ‘Sa Calobra’, even though strictly that’s the name of the village at the bottom). According to the sign at the bottom, its a 9.5km long climb, with an average 7% gradient. In some places it ramps to 10% steepness and beyond. The total vertical height climbed is just under 700 metres. It’s used by the pros that train on the island, including those from Sky Pro Cycling (who I think stay in a hotel in Alcudia) and British Cycling. I could try to describe the climb in minute (yet entertaining) detail. It wouldn’t be accurate though, as I spent the best part of the 58 minutes it took me to crest the climb focused primarily on my front wheel (when I wasn’t on lookout duty for coaches). Luckily I can link to the accounts of other cyclists that have climbed it in a far more coherent frame of mind than I.
I mentioned that professional cyclists frequently test themselves on Sa Calobra. If you want to see them in action, road.cc kindly gathered together videos from three of the smaller British pro teams. Strava classifies Sa Calobra as a Category 1 climb. Montgomery classifies it as ‘awesome’. So that was my summer holiday. Other things happened as well (beaches, swimming pools, kids-in-meltdown, cerveza, barbecued squid) but frankly that all pales into insignificance against the cycling. 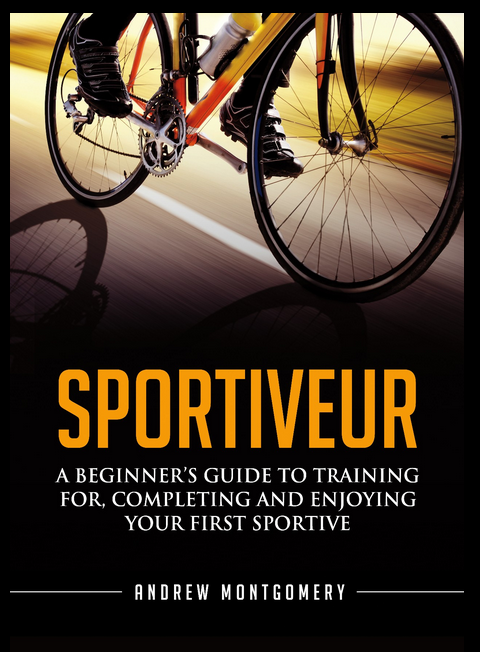 Now I need to focus on putting the finishing touches to my training (such as it is) for RideLondon (only 12 days from now) and think about logistics, equipment and nutrition. I’m sure there’ll be posts on these topics in due course. I hope your training is going well and that you’ve been able to do some of it in the sun (whether that’s at home or abroad). As always, please do sign up for the Grimpeur Heureux email list to get all of my musings delivered direct to your inbox. Wow, a category 1 climb…awesome! Congrats on that climb as well as the great cycling. I’m glad I’m not the only dad who plans his trips in a specific order…cycling, beer, and then family. Seemed to work well. Thanks Brian. If you ever make over to Europe then I recommend Majorca as a great place to combine cycling and other more family-friendly activities (including lots of flatter routes for the kids to enjoy). Thanks Giles. With a block of training behind me, it feels like I can focus more on enjoying the day rather than wondering whether I’ll limp in under the time limit. It’s not quite as fashionable as Majorca, but if you fancy a change, try the algarve. Quite a few pros have started coming here including Frank Schleck ealier this month and Jurgen Van Den Broeck who has a house here. It’s bigger than Mallorca and has half the population. In winter it’s brilliant, empty roads, you can go for hours and not see a car. There’s a great variety of terrain too. I’ve been on a number of family holidays to the Algarve (around Lagos), 15-20 years ago and would gladly go back. The main reason we chose Majorca over the Algarve this time round is that me and my wife learnt some Spanish whilst traveling on our honeymoon – Spanish holidays allow us to try to keep our language skills limping along. In Portuguese, I’m limited to Obrigado and Bom dia. was there in April on a holiday with the non riding wife. Agree with all your descriptions. Nice whether even then but the culmination of the week was the Duva Sportive and it rained heavily with snow on the mountains. huge amount of climbing but very satisfying despite the weather. Is that the one where the military allow you to climb Puig Major? That would be something special. No this is just up to the highest normal road point. The last 200m climb is open only once a year due to the military road as you say.